Inferno review: "Early promise proves misleading in a sequel that should be far better"
Early promise proves misleading in a sequel that should be far better than The Da Vinci Code than it actually is. He traced Christ’s bloodline in The Da Vinci Code and stopped the Vatican going kablooey in Angels and Demons. What’s left for an encore? 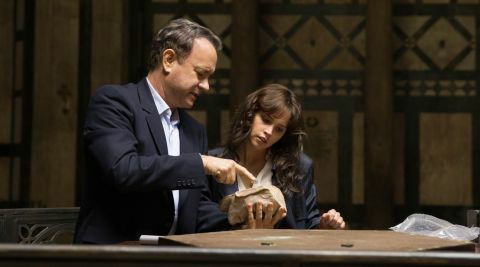 For Harvard brain-box Robert Langdon, nothing less than attempting to save humanity will do in Inferno, the third of Dan Brown’s novels to be brought to the screen by the dream team that is Tom Hanks, director Ron Howard and producer Brian Grazer. This time around, Hanks’ puzzle-solving symbologist has a major handicap – a wound to the noggin that has left him plagued by apocalyptic visions, suffering “mild retrograde amnesia” and prone to “nausea, confusion and dizziness” according to the doctor. This leaves him in no fit state, then, to deduce the current location of a Doomsday virus cooked up by a bonkers biologist (Ben Foster) as a cure for the planet’s overpopulation, even with the aid of a resourceful yet doe-eyed medic (Felicity Jones) who comes to his assistance after he wakes up groggy and disoriented on an Italian hospital gurney. No sooner has he done so, of course, than an implacable assassin (Ana Ularu) starts shooting at them, sending Hanks and Jones out into Florence on a Dante-driven scavenger hunt that has the combined forces of the World Health Organisation snapping at their heels. It’s enough to ensure a breathless first hour that takes in everything from the Palazzo Vecchio to the Boboli Gardens, interspersed by nuggets of Wikipedia knowledge, visuals from a drone’s POV and hellish dream sequences that give Inferno a stylistic audacity absent from its 2006 and 2009 predecessors. Hour two, alas, is an entirely different kettle of fish. Here Howard exchanges the streamlined kineticism of a race-against-time thriller for a bewildering tumult of reversals, flashbacks and contradictory information. Meanwhile a mushy romantic subplot involving Borgen’s Sidse Babett Knudsen gives rise to a whole new sub-stratum of irrelevant backstory. Not only that, but there’s also a pointless side-trip to Venice that stops the film dead just when it ought to be gathering momentum. In spite of all this, though, we are still left with a feeling of both missed opportunity and nagging frustration. Having already taken two rides on the Dan Brown merry-go-round, shouldn’t this have been the one where Ron finally got it right?